Yealink SIP-T23G IP Phone | 8x8, Inc. 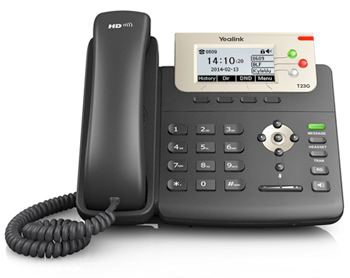 Designed to maximize productivity for serious business users, the Yealink SIP-T23G Phone is a workhorse business phone at a breakthrough affordable price. It offers HD voice capability and provides crystal-clear voice communications—and the user interface is intuitive and easy for busy new users to learn. HD Audio—Yealink HD audio implements wideband technology to maximize sound quality. It leverages advanced acoustic technology such as full-duplex audio, echo cancellation, and dynamic jitter buffer to provide clear lifelike voice communications. Three line keys with LED indicator—The SIP-T23G model comes with three line keys with LED indicator, so you can easily manage two live calls on your phone at the same time, and still program a frequently used speed dial on the third line key. Call Management—The SIP-T23G delivers productivity-enhancing PBX features such as call park, call forward, call transfer and three-way conference calling. This makes it an efficiency tool for today’s busy small and large office environments. Efficient Installation and Provisioning—Deployments are easy with the integrated Power-over-Ethernet (PoE) option, for centralized powering and power backup. The SIP-T23G also supports protocols for remote provisioning and simple activation, as well as an encrypted configuration process for additional security.